“Americans required fabrics for clothes, towels, sheets, blankets, sails, and dozens of other items made of wool, cotton, silk, linen, and hemp and bought them from textile manufacturers… though England dominated the American market, the colonies had domestic producers, mostly in the northeast. Some southern planters had slaves make cloth, promoting self-sufficiency and keeping agricultural laborers busy off-season and in bad weather. During the Revolution, when Americans could not get English goods, weaving became a necessity and a patriotic duty” (Crews). “Spinning, the process by which fluffs of raw fiber were twisted and counter-twisted with a hand-held spindle or spinning wheel into strong, smooth lengths of thread for weaving, was so ubiquitous a female activity that the word “spinster” was also used to mean an unmarried woman … but weaving, especially in Britain and continental Europe, was a job typically held by men. Weavers were skilled craftsmen who had been trained in apprenticeships and formed guilds, trade unions and other associations to protect their craft” (Allen). The Potsdam Public Museum notes that “In an effort to prevent the colonists from manufacturing their own goods, the English put high tariffs on looms and spinning wheels and passed acts forbidding the export and sale of American made textiles. 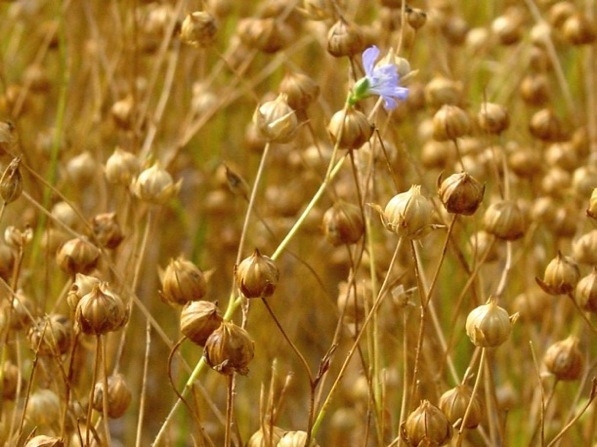 The colonists, being a very independent people, began growing flax and making their own fabric to reduce their dependency on British imports. 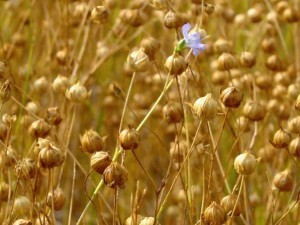 Flax was one of the earliest crops planted in the colonies. It was not only made into fine fabric (linen), it was also used to make rope, stuffing for mattresses, towels, grain bags, wagon covers, sails, upholstery fabric, and so much more (“Spinning-Weaving“). “Most farmers and plantation owners grew small amounts well into the 1800’s for their own use,” adds Historic Jamestowne of Virginia, “The plant, which provides the raw material from which linen is made, is an annual which grows two to three feet high on a slim, little-branching stem. It is this woody stalk, hollow when dried, which is harvested and ultimately manufactured into linen” (“Flax Production“). Until the 1850s there were no chemical or commercial dyes available. Before that time, dye colors were made from materials found in nature. Most notably, Colonial Williamsburg adds that “An insect called the cochineal from South America makes the color red. 70,000 cochineal are needed to make a pound of red dye that can turn everything from leather to makeup and frosting red – including paint and textiles. 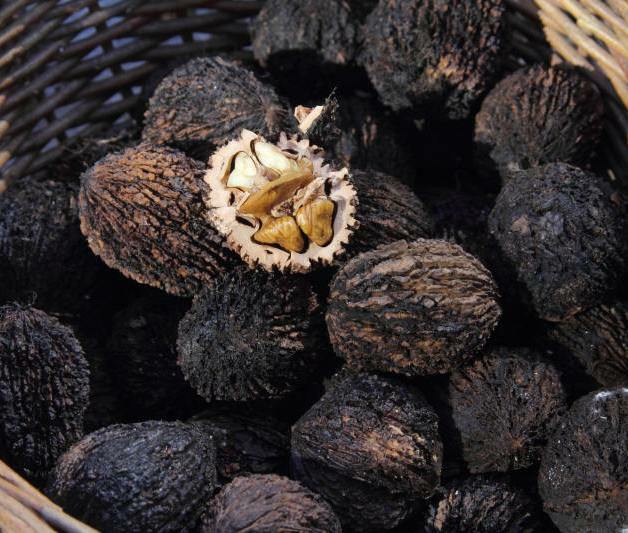 Brown comes from walnuts, blue from indigo from South Carolina, Spain, or South America. Purple comes from the heartwood of the tropical Campeche tree cut by Colonial Spaniards in Mexico, and turmeric from India gives yellow its hue. Orange comes from the root of the madder plant. 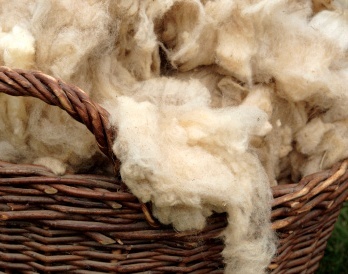 Wool is the easiest fabric to dye; cotton is more difficult, and linen is the most difficult of all – the dye tends to sit on the linen, in a sense, not in it. Dyeing was often done on plantations, using different colors of clothing to identify slaves from the same plantation – colorful and expressive folk art came from this practice as slaves used the rich colors to express individuality” (“Weaver“). 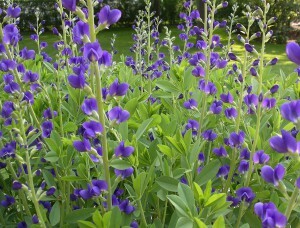 Plants in the dye garden, in front of the Basket Studio, are best viewed during the summer months and are labeled. The more common natural dyes are black walnut, onion skins, golden rod, indigo, marigold, and madder. Some of these dyes are on display in the Weaving Exhibit. Most dye plants are boiled to extract the dye color, and the plant material is strained off. Yarn is put into this dye bath and simmered. Tempe Herndon Durham, a former slave from Chatham County, recalls: “Mammy Rachel stayed in the dyeing room. There wasn’t nothing she didn’t know about dyeing. She knew every kind of root, bark, leaf and berry that made red, blue, green, or whatever color she wanted. They had a big shelter where the dye pots set over the coals. Mammy Rachel would fill the pots with water, then she put in the roots, bark and stuff and boil the juice out, then she strain it and put in the salt and vinegar to set the color. After the wool and cotton done been carded and spun to thread, Mammy take the hanks (skeins) and drape them in the pot of boiling dye. She stir them ’round and lift them up and down with a stick, and when she hang them up on the line in the sun, they was every color of the rainbow. When they dripped dry, they was sent to the weaving room where they was wove in blankets and things” (American Slave Narratives: An Online Anthology). Poplar Grove would have had skilled slave women, and young slave girls and boys, who would apprentice in the arts of weaving, dying and spinning. If other nearby farms had such chores assigned to family members, the large-scale operations of Poplar Grove necessitated that – like at Tipton-Haynes Historic Site in northeastern Tennessee – “The men and older boys took care of the animals, sheared the sheep each spring, and many had the carpentry skills to make the tools necessary for spinning and weaving such as spinning wheels, yarn winders, and looms. Young children would be taught how to pull or “tease” the raw wool to prepare it for carding. Both boys and girls would help with the carding. About seven or eight, girls would be taught to spin on a drop spindle then later the wheel. Boys would learn from their fathers how to care for the sheep and perhaps learn how to make small objects such as a shuttle or drop spindle. Weaving on the large ‘barn’ loom was done in the winter when there were fewer outside chores” (“Spinning Fleece“). The wool here was sheared from the sheep at Poplar Grove, usually once a year in April. The wool from a single sheep is called a fleece. “The fleece would then be washed carefully in hot soapy water and dried, or it would be carded and spun without washing it first. This technique is called ‘spinning in the grease.’ Sheep have oil in their skin that lubricates the fiber and keeps their skin dry when it rains. Before spinning the wool into thread, it needed to be cleaned of dirt and vegetable matter (like hay and straw). This was a job typically done by children between the ages of three and four years old. To prepare the fibers for spinning, it must be carded. The wool is placed in small handfuls on the wire teeth of the cards, then one card is pulled across the other, brushing the wool free of dirt and tangles. The wool is then removed form the cards and rolled into a rolag (“Spinning-Weaving“). The carded wool is spun into yarn. In its broadest sense, “homespun” meant simply not imported. It was not unusual for plantations to have facilities and equipment for spinning and weaving” (Shaw). This was no less true for Poplar Grove, in which Mary Ann Simmons Foy would have ordered cloth from the city of Wilmington for both fashion and industry. Any cotton grown at Poplar Grove was for personal use. Cotton, an annual plant, requires a long growing season and warm temperatures. The cotton plant flowers in summer, and, as the flowers fade, forms a green pod called a cotton boll. Inside the boll cotton fibers grow until they burst open the boll and the fibers can be picked out of the boll. Cotton must have the seeds removed, a job that was done by hand, often by the slave children. After the seeds are removed, the fibers are carded into batts, which can then be spun into yarn. Cotton is harder to spin by hand than wool because the fibers are shorter and dryer. The hand-spun cotton yarn was not as strong as wool. Located in the basement of the Manor House, the Weaving Studio is part of the Slavery Exhibit and open to visitors. Allen, Erin. “George Washington and the Weaving of American History.” Library of Congress Blog, March 10, 2015. Crews, Ed. “Weaving, Spinning and Dyeing.” The Colonial Williamsburg Journal, Winter 2007. “Flax Production in the Seventeenth Century.” Historic Jamestowne. National Park Service, US Department of the Interior. Hoke, Alexa and Terry Brandt. “Through the Wool Cards …” Bittersweet, Volume II, No. 4, Summer 1975. Springfield-Greene County Library. Industrial Revolution. Fordham University. Internet History Sourcebook. Leloudis, James, and Kathryn Walbert. “Work in a Textile Mill.” Learn NC: K12 Teaching and Learning from the UNC School of Education. “The Mill Girls.” Lowell National Historic Park. National Park Service, US Department of the Interior. Shaw, Madeline. “Slave Cloth and Clothing Slaves: Craftsmanship, Commerce, and Industry.” Journal of Early southern Decorative Arts. August, 2015. “Spinning Fleece into Yarn.” Tipton-Haynes Historic Site. “Spinning-Weaving Exhibit.” Potsdam Public Museum. “Weaver.” Experience the Life: Trades. The Colonial Williamsburg Foundation. “Weaving.” The Columbia Encyclopedia, 6th edition, 2015.